Back in 1995, KaBOOM! 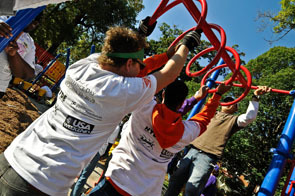 marked Make A Difference Day with our very first community built playground in Washington DC. Now, 15 years later, we mark it with our 1894th build, also in DC. 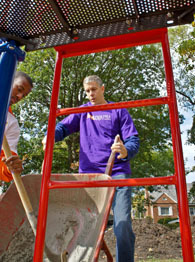 On a brisk Saturday morning, 500 volunteers converged at Hyde Leadership Public Charter School to mix concrete, haul mulch, nail boards, and assemble playground components. After some warm-up exercises from Cornell McClellan, the Obamas’ personal trainer, the blood started flowing to our fingertips and toes. An inspiring round of opening remarks from Corporation for National and Community Service CEO Patrick Corvington and White House cabinet members—including Secretary of Education Arne Duncan, Secretary of Housing Shaun Donovan, Secretary of Agriculture Tom Vilsack, and Secretary of Transportation Ray LaHood—helped to energize our still-groggy minds. Said Duncan, "Every school should have a playground." Donovan added, “My goal is not just to make sure that every school has a playground but that every neighborhood has a playground.” Vilsack chimed in, “If you eat right and play hard, you’re going to live a long life.” Then LaHood sent us off to work with an energetic, "KaBOOM!" And yes, though we’re passionate about play, there’s no getting around the fact that building a playground takes a lot of work. 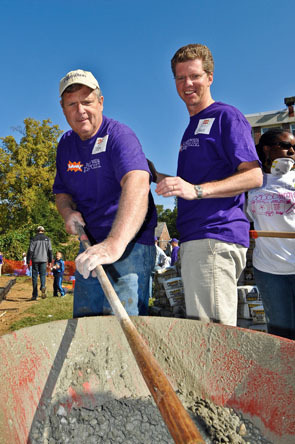 Vilsack showed off his concrete-mixing skills, Donovan excelled at assembling the school’s new rock wall, Corvington worked his magic with bolts and rivets, and Duncan was a tour de force trucking wheelbarrows of concrete and mulch. Not only were we building a playground, but also a pathway, an outdoor classroom, picnic tables, benches, and garbage cans. That’s not to mention planting three gardens, creating asphalt games, and painting 1’ x 1’ murals. 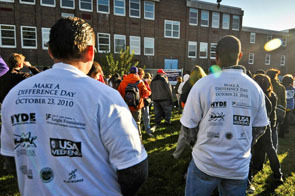 The kids who came out to volunteer were true champions, wielding shovels and rakes along with the rest of us. But they also got to take some breaks for play (after all, what’s a day of work without a play break? 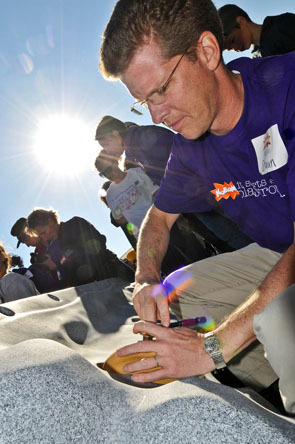 ), during which they romped around with our friends from Playworks, playing games and building and rebuilding structures from custom designed blue foam blocks, otherwise known as Imagination Playground™ in a Box. 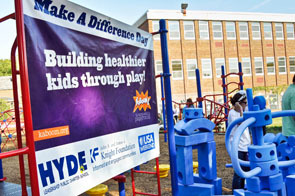 Thanks to the generosity of our supporting partner, the Knight Foundation, Hyde-DC’s brand-new playground includes both traditional play structures and loose parts from Imagination Playground™ in a Box, which allows children to constantly reconfigure their environment and design their own course of play. By the end of the day, though our backs ached and our heads were caked in dry concrete, we couldn’t help but feel happy for Hyde-DC students, who now have a very special place to play. 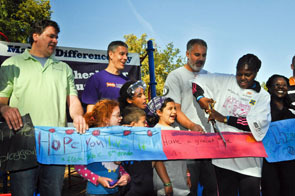 And we are now one step closer to Secretary Donovan’s vision of a playground in every school and neighborhood.